I’ve monitoring that actually funny thing you mentioned it. 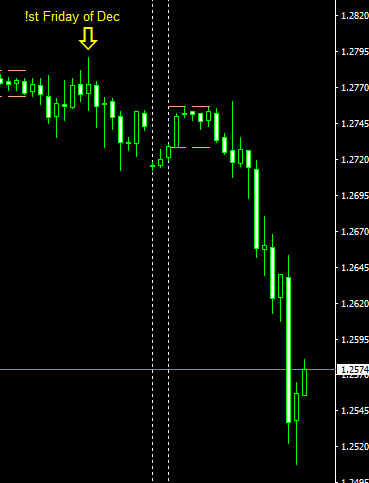 I also trade EUR/USD with cable so I’m thinking of getting a possible double short on these guys. Not sure yet I’ve always been a punk when it comes to taking risk so knowing me I’ll wait until the last second to make an informed decision. The more knowledge I have going in the less risky the trade seems to me. Perhaps the wisest words that I’ve seen in a long time. The thing with going double is your risk is equally so - often on knee jerks, especially on NFP both cable and fibre will follow the same path and you could find stops getting hit around the same time. Most likely during the most liquid time at market opening time US and just when UK are winding down for the weekend - more automated then. Oh for sure, I’m definitely exercising the upmost risk because like you said it can easily go the opposite direction and really knock me out with double the power. That’s why this week I’m out there listening for certain words or terms that signal some sort of direction. Aye, oft times you will read that FA is already priced in - this is true insofar of what the market expects - a little like the numbers represented on broker calendars. The words and terms are all in the market right now on the thread title. The key is to understand market expectation - and as always it is the most simple. The market expects that the parliament vote will fail - if it doesn’t then a huge GBP buy, if not then some selling, but to a lesser extent. Then comes the market unknown, the PM knows well the likely outcome, so what’s the follow up? Either a G Election or another referendum (getting more like CHF) - why go around the country as if electioneering if not either one. Anyways you can see the indecision on Eur/Gbp, Eur/Usd and Gbp/Usd on Friday past. True there is definitely a lot of uncertainty getting so close to Dec 11th. I expect some more good secrets to spill this week or some more conversations in parliament & in the house of commons. It’s definitely going to be a wild ride nonetheless and yes the general market sentiment has a bearish tinge of this deal not going through. That’s how I see it too - I’m wondering whether a long - just on the odds could be in order ? The one thing we actually know about politicians is that their integrity goes out the window when it is a case of “Vote my way or General Election” ! Nah - only if I’m into gambling. Not sure that there is much integrity nowadays in politics - one person close to my heart once said “you cannot eat a flag” . He was a peace winner first and a politician second, but they are becoming thin on the ground. Sometimes I see the words ‘project fear’’ - for me as an oldie, the undoing of all that a peacemaker has worked for is my fear. US Senator George J. Mitchell, US President Clinton, US President G W Bush, UK PM John Major, UK PM Tony Blair - and of course many, many others. Bit of a “politician” himself then ? At least a “Notional Christian” one might speculate ! We’re All into “gambling” in our own way iff’n the odds are right ! Maybe they’re Not ! - or maybe - just maybe the big banks are buying ? Bernard Baruch said “I buy my straw hats in the fall” - a principle which stands in good stead as a rule. “peace and Harmony” are great objectives, but occasionally one has to say - “Enough is enough” and take a stand! The largest number of people ever to have voted in the UK have decided to do just that and will not be happy if that garbage gets through Parliament ! I wonder if @rrram2 has an opinion on this ? - to me it feels as tho his “micro - entries” system could be worth a punt here ! It is a huge con and these politicians,Especially May obviously think Brits are stupid,May should never have been PM ,She only looks happy when she is with the EU leaders.Woeful times for Britain. The sooner we get a new ‘’ non stubborn remainiac ‘’ PM and out properly , The sooner we can crack on in my opinion.! Hope there were some pips made after the first Friday calm. David Cameron is somewhere sipping wine giving himself praise right about now. Happens that is the same level that last week opened with. Is also the mid level of last week’s action. I believe that the people of UK have gotten themselves in a pickle. Majority of the people didn’t realize what they were voting for. Theresa May also survived a vote of no-confidence. I hope that the Brexit doesn’t come back to bite the people who voted for it. Do not believe the British public were confused, they were not - but they voted on vague political grounds, not precise economic ones. The vote was for control of immigration, freedom from EU Directives and the primacy of UK courts rather than the EU’s. It was also an expression of frustration and opposition to Conservative government austerity etc. policies following the global financial crisis. On pure economic grounds, there wasn’t a real justification for a referendum on EU membership, so this was always a political referendum, even leaving aside any motivation behind it as a mechanism to weaken EU-sceptics within the Conservative party and to arrest the growth of UKIP. Do not believe the British public were confused, they were not - but they voted on vague … grounds, not precise … ones. You’re right there - we voted for “FREEDOM” - freedom from restriction, regulation, nit-picking micro management of our affairs - this “Deal” business is exactly an example of this pointless micro inspection of every aspect of our lives ! WE never voted for any form of “DEAL” and most of us are completely perplexed as to exactly why those charged with getting us out are so insistent about a “deal” ! It is quite obvious that anyone in the uk who wanted french cheese, would get some and anyone in France who wanted English beer - would get some ! Hell - way back in the stone age we in the uk were importing goods and artifacts from Southern Europe, why should we need a “Deal” for our people to excercise some initiative in these days of computers and telephones ? Around 0 AD - we had our rules and regulations set by foreigners in Rome - we didn’t like it any more than we like having our lives dictated by some committee of chinless doobs in Brusssels ! We voted to take back controle of our own destinies ! - not for some slightly different set of “Rules” dictated by those we wanted away from in the first place ! THose who say we were just - plain ignorant because we didn’t know what we were voting for are fundamentally wrong ! ANd if they insist on pursuing this “Non-Brexit” farce - they will find that out the next time we are permitted to have our say and we comprehensively sack All those of whatever party who have broken faith with our instruction ! I have heard the term “Civil War” used - probably that is not practical in our abused and controlled society - but nevertheless “Interesting Times” in the chinese way ! I take the long view and the referenda of Quebec (of which were two) both failed, as did the ones in Greece and Spain, as well as in Scotland, in more recent times; if it came to some like the Irish abortion referendum, I would say that on a specific issue such as this then you are more likely to get a meaningful outcome: in the case of broad referenda such as the two Quebec province ones and the Scottish one, the question was too simplistic in relation to the issues involved and that is why nobody felt comfortable with voting it in. There also needs to be support for an idea both politically and in the country: abortion referenda in Italy and Ireland have been won through huge appetite in the general public for change in a particular area of their lives, but what appetite was there for coming out of the EU in the UK? If you look at how unprepared politics were for the result, and how close the vote result was, I would say that, unlike in the case of foxhunting ban, smoking ban, abortion legalisation and other pieces of legislation where parliament was culturally behind a change in social practice, there was no unity in thought or desire for change. Cameron rushed through the referendum without really testing the mood in the whole country and in parliament in terms of appetite for this particular broad theme. This is why there is no consensus and on this occasion the fact that there was a winning vote does not really help solving the issue. Simply continuing to repeat ‘we must implement the will of the people’ may seem proper but it is ineffective at this point. It was a bad referendum, or if you want to refer back to financial trading, it was bad timing - and we all know how bad timing can negatively impact what could seem like the best idea to start with. … then, how many people would have got so exercised about it? It would not have stirred as many passions… A question such as “Should Scotland be an independent country?” in the 2014 referendum had emotional potency attached to its wording, and stirred equally strong passions. So the EU referendum was also worded to stir emotions rather than calm debate, which was to be its downfall in terms of implementation. “Top dogs” are leaders and what they say goes ! In order to function adequately, the under-dogs need to be able to accept their position as “Rule takers” - If you ask an under dog whether it is happy - it will say what a wonderful life it has being led by such a magnificent beast as “Top -dog” ! Under these circumstances it is remarkable and brave for any population to vote for a change rather than just preservation of the status quo !